Shared use: Canal Way premium cycleway in the Docklands is interrupted by shared use at a junction. One of the most often heard complaints about cyclists is cycling on footpaths. So, it would seem a bit like madness for the councils who design our roads and streets to continue to design space which mixes cyclists and pedestrians. Canal Way cycleway: Two-way cycle route meets shared use, at a pedestrian crossings. But that’s exactly what they do. In cycling design terms “shared use” is a surface on which cyclists and pedestrians are mixed. The use of this design choice seems to be one of the main factors so many Irish cyclists are against segregated cycle paths. Groups representing the blind also oppose its use. Generally, when out people are out walking many don’t like mixing with people on bicycles given the difference in size, movement and often speed — this is especially so when with small children who are walking or in prams. But councils persist in using it. The National Transport Authority persist in accepting it as useful regular tool rather than one which is used only in exceptional circumstances. Worst of all the Department of Transport recently made shared use space legal — rewarding councils for using shared use for decades without any legal backing. Or maybe worst of all it use isn’t restricted to quite lane ways or greenways, but instead it is used in busy urban areas on apparently premium cycle routes. This isn’t just a legacy issue. Dublin City Council used shared use on a large amount junctions on their canal route which opened last year and they plan the same for a section of the Sutton to Sandycove route at Bull Island (details here— public consultation closes on Monday February 18, 2013). Cyclist on a footpath? No, shared use. Will the planned quays route be next? If it is, the council are shooting it self in the foot. Using shared use in the design would turn many would-be supporters off or fully against the project. In some cases, shared use may be more justified than in other cases, but if the Dutch and Danes can generally live without shared use, we can too. Excuses have to be seen for what they are. Our current segregated cycle path designs include a heavy amount of shared use. This shared use is more linked to UK designs – rather than following leading cycling countries, the Netherlands and Denmark, which keep cyclists and pedestrians firmly separated in almost all cases. 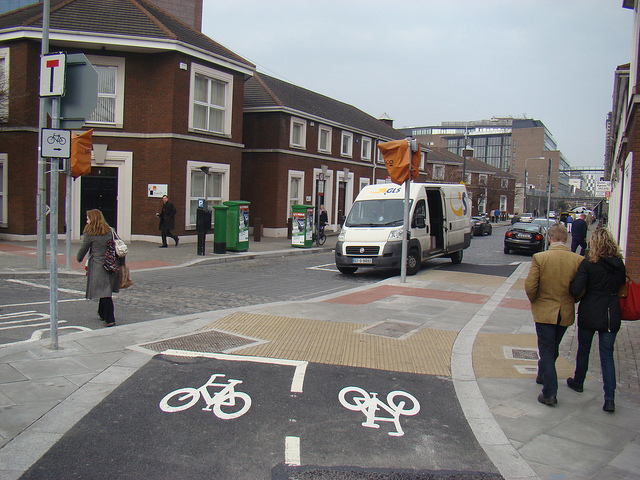 Dublin City Council is in fairness the Dublin council with the least amount of shared use – but mainly because most of its substandard cycle lanes are on-road. Older shared use, revamped in recent years, on the Finglas Road, Dublin. One excuse is a lack of space. But even with projects where’s there’s a ton of space the apparently easy option of shared use if chosen. A prime example is the Leopardstown Link Road reconfiguration scheme planned by Dún Laoghaire-Rathdown County Council. But that’s only one of many such examples. Even with the city council’s Canals Route and Sutton to Sandycove route, shared use can’t be justified by the lack of space alone (even if some of it can). South Dublin County Council and Fingal County Council both make heavy use of shared use and both are lagging miles behind for cycling. Both not only have dismal amounts of people cycling and the lower percentage modal share for cycling, but also the slowest rates of growth. The shared use implemented by these two councils more often than not “pedestrianises” cyclists – forcing those on bicycles into pedestrian crossings which they are legally unable to use without dismounting at every crossroad. A ramp onto shared use in Drumcondra. 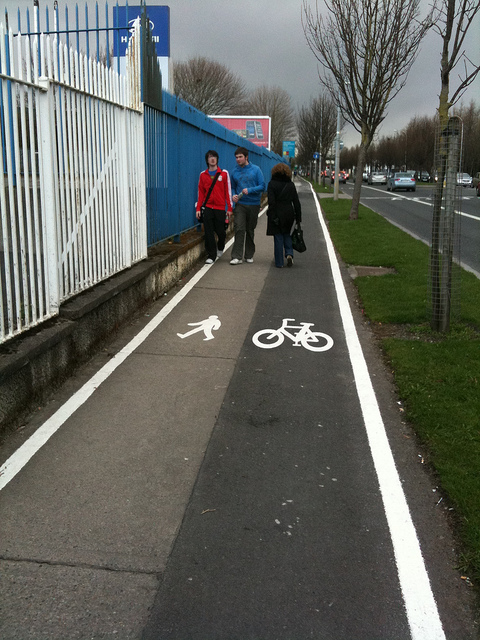 In recent years councils from around the county have been following Dublin’s footsteps in implementing shared use – often clocking up kilometres of cycle lanes by doing noting much more than painting lines on existing footpaths and, if you’re lucky, ramps on and off the footpath. Given the anger out there against cyclists using footpaths, you’d think campaigning against shared use would be easy. The UK has groups such as the Cycling Embassy of Great Britain publicly pushing against shared use at every chance they get. Back on our side of the Irish Sea, rather than pushing for high quality segregation – as used in the Netherlands, and Denmark – Irish cycle campaigners to-date seem to be too busy arguing against segregated. Their goal has been massively unsuccessful. Instead, boom time Ireland and continued funding for cycling even in the downturn, has resulted in streets and roads scarred by unattractive to barely unusable cycle tracks. I think you’re being a bit unfair with the first examples you give. The shared use on those example only concerns the junction environments, pedestrians and cyclists are segregated otherwise, each with ample width at their disposal. Nothing comparable to the older “real” shared use, such as on Finglas road. To the question in the title, the answer is that the recent designs simply comply with the cycle manual. That in itself is a good thing. But obviously, the cycle manual can be improved in many places (and yes, that does include in my opinion the excessive recourse to shared use treatments for junctions), and this is what should be achieved (along with a change from it being a recommendation to it being a design standard). As for what they do in the Netherlands, it’s a bit different, but there they do use in limited circumstances treatments that look like shared use, but that’s for cars, at junctions with minor roads: http://departmentfortransport.wordpress.com/2012/08/21/continuous-paths-across-minor-junctions/ Not quite what you talk about in this post, but my point is just that shared use at junctions makes some sense in some cases, and is a very different thing from the much despised shared use cycle tracks. Incidentally, the third photo doesn’t look like a shared use, but rather like a toocan crossing (I’m just judging from the photo, I don’t know the place), and similar arrangements are quite common in fact in the Netherlands. I don’t think I’ve been even slightly unfair — if anything I’ve held back. The recent and planned Irish designs are a mess compared to Dutch and Danish segregated cycling. Getting junctions right is key to getting segregated cycling right — it’s why Dutch cycling bloggers focus so much on junctions. We’re taking about what are supposed to our premium cycle routes — routes which are supposed to extend the attractiveness of cycling short and longer distances. The NTA have made it crystal clear that the options in the cycle manual are a menu of options, but the menu is neither exhaustive nor prescriptive. Your link http://departmentfortransport.wordpress.com/2012/08/21/continuous-paths-across-minor-junctions/ deals as the title of the blog post says: “Continuous paths across minor junctions” — this is nearly as far from shared use as you can get. The third photo has shared use between the cycleways and the crossing and the same thing on the other side of the road. As far as I’m aware there’s no way similar arrangements are quite common in the Netherlands — I have yet to see any examples of it. They keep pedestrians and cyclists separated at junctions. The Danish also do the same. When in Copenhagen (which is behind the Netherlands in many respects) this year, I was struck again how seamless their cycle paths were — and walking was much the same. Here, off-road paths (bar a very few) are a mess and anything but seamless. 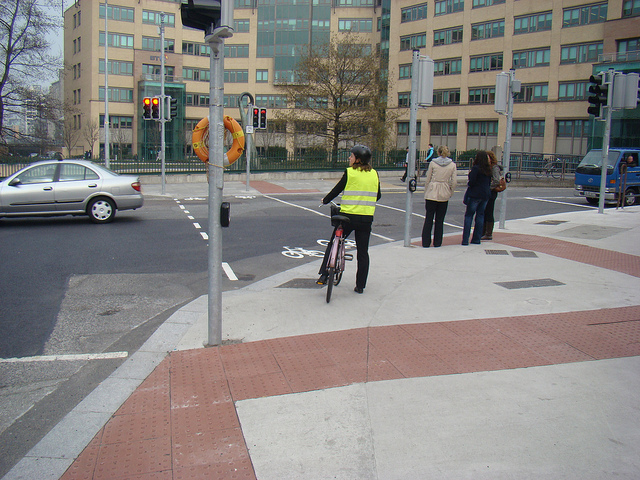 Being a Dutchmen in Dublin who uses the ‘third picture’ crossing each day going to work, I find it unbelievably badly designed. – Pedestrians are always standing where the bike sign is on the ground. 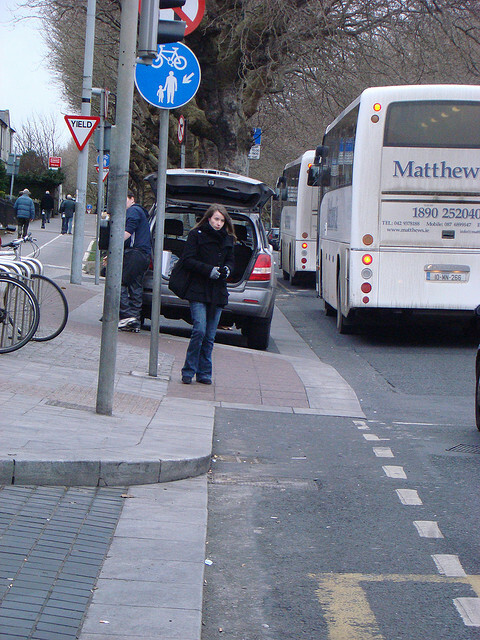 – Pedestrians are walking to take the other light, standing in front of the cycle lane waiting for their light. – Cyclists coming from shelborn road who like to get to the canal lane usually have no space to pass, as in the morning there are too many pedestrians and cyclists waiting at the light. – I’m always taking a right turn there, and I’m supposed to cross fully and do a 90 degree turn around the traffic light pole to the right. Usually pedestrians are there getting to the curb as we share the same light. Not to mention that bikes are not made to do short 90 degree turns. So I usually wait a bit and scoot to the right early before the pedestrians from the other side come close. I’ve had and seen some awkward moments there. – Traffic light sequencing. This is one of the few lights on the south canal where pedestrians and cyclists have green at the same time. For this one it also makes sense to separate them. (but then cyclists also need to adhere to it, I’m often the only cyclist waiting at the bike light for it to go green). North quay coming from the O2 to the Custom House. The number of times cyclists are supposed to go in and out of bicycle lanes. Mix with pedestrians. Do 90 degree turns, etc. is incomprehensible not to mention super dangerous due to large traffic users taking up most of the lane space. I’ve long thought the best example of cycle path WTFery is the placement of the bins on the City Quay cycle path. They are sandwiched between the cycle path and the road, which means that anyone who want to put stuff in them has to be on one or the other. For pedestrians, they’ve got a choice of chucking stuff in the Liffey, or wandering onto, oooh, a different colour path. The whole cycle path is a mess, but the bins…the bins take it to a whole new level. Thanks for your response! First of all, let me clear two things. First, I’m only judging those designs by what I see on those photos, extrapolating the missing bits with the Cycle Manual design they mostly look like, as I know none of those places (I don’t live in Dublin, and come in Dublin very rarely lately). I understand I lack of context particularly for the third photo, and that your main issue is with the treatment on the areas surrounding the crossing, more than the crossing itself. Point taken. Second, I surely don’t claim I like the design of those junctions, and indeed, I find that the Cycle Manual relies unnecessarily too much on shared use treatments for junctions. My only point was to say that there is a difference between shared use at a junction and shared use all along the way (which, as far as I remember, doesn’t feature all that much in the Cycle Manual). In other words, first photo (Canal Way in the Docklands) and fourth photo (Finglas road) are far apart on the scale of bad design. Putting both under the common label of “shared use” is, I find, a bit oversimplified, and thus a bit unfair. I find it denies the huge leap there already is between the older design and the most recent one. For example, I don’t think anyone used lack of space as the reason for the design in the first photo. They could have easily done a much better design with the exact same use of estate (for the second photo that’s less clear). I also find it unfair to blame the councils, when all they do on the recent designs is apply (more or less) the designs of the Cycle Manual. As you mention in your post, the NTA is more to blame here. In my opinion, campaigners should ask for an improvement in all those parts of the Cycle Manual that are still not good (and that includes those shared use junction), and make the Cycle Manual prescriptive (which implies that when an array of alternatives is provided, there should be clear guidelines for making a choice). That should allow us to concentrate all our efforts in one place, instead of lobbying with our respective council in an uncoordinated way. As for the link I was providing, I didn’t make myself clear, but the analogy was between the place of the car on the Dutch junction and the place of the cyclist on those shared use junction. My only point here is a general one (not specifically for those photos, in particular not the third), which is that “shared use” on junctions can sometimes have its place, namely to stress pedestrian priority or pedestrian+cyclist priority (as is the case for the Dutch design) when that applies. I don’t know those junctions at all – I’ve never even been to Dublin! – but from your photos it looks like the corners of the road have a very smooth, wide radius, to enable cars to travel round them without slowing down too much. This means that there’s not as much room for people on foot and on bikes. Reduce the radius of the corners, and all of a sudden there’s plenty of room for a full-Dutch, unambiguous design. By the way, I don’t know if “toucan crossing” means something different in Ireland, but here in the UK it means a fully-mixed cycling/walking crossing, i.e. without separate paths (which I never saw in the Netherlands). The crossing in the third photo isn’t that, but has separate ‘lanes’ for people on foot and on bikes (which the Dutch do have). Finally, I wrote that article about the continuous paths across minor junctions. (I love the concept!) I think the analogy with them fails in that they’re used to give pedestrians priority where there will be very few motor vehicles, such as a residential street – they wouldn’t be used in an area where there will be lots of traffic. Similarly, I think that these shared use junctions can only work if there are very few pedestrians, or very few bikes – and surely “very few bikes” is not what we’re aiming for!